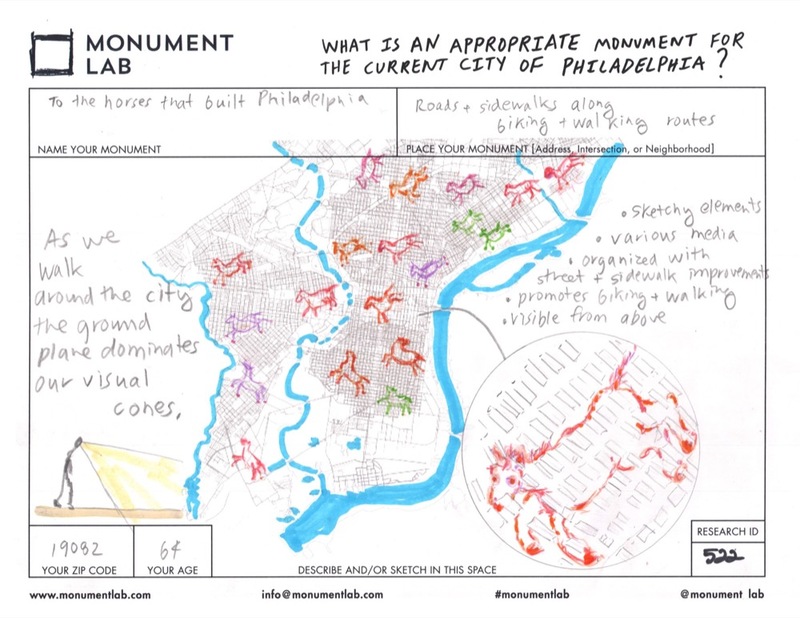 During the 2015 pilot phase, the Monument Lab team collected 455 monument proposals from public participants at Philadelphia'sCity Hall. Each person was invited to describe and/or sketch an idea, offer a proposed location for a monument, and optionally share their zip code and age. Each monument means something to the person who visualized it as a representation of what the city means to them, and, in turn, how they are a part of the city’s ongoing history and memory. Our goal is not to choose the best proposal or only select one to realize, but rather continue to critically organize and reflect on the collective knowledge produced through this creative research project. Philadelphia Monument Lab’s team of scholars, curators, students, and artists will continue thinking through the public’s proposals with future installations, publications, and creative collaborative research. The proposals are available as a free dataset on OpenDataPhilly. We welcome your observations, maps, and ideas. We invite you to reflect with us through reading the data and continued dialogue on the history and future of Philadelphia. Each point represents a proposed monument to answer the question "What is an appropriate monument for the current city of Philadelphia??" Explore the 455 monument proposals collected by the Monument Lab team. Monument Lab Research Interns meet with members of the City of Philadelphia’s Office of Arts, Culture, and Creative Economy staff at City Hall in July 2015.